This delicious homemade Lemon Curd Recipe will become one of your favorite staple recipes. The texture is creamy (not grainy like some others). Perfect for pie, tart, and donut fillings. Or a delicious spread on breads, muffins, and scones. And a variety of lovely dessert recipes too! Be warned, it’s mighty good by the spoonful too. Hopefully there will be some left to bake with. Just a thought… Consider giving jars of this delightful homemade lemon curd as a great “gift from your kitchen”. Bonus Bite: Use this lemon curd with our Lemon Curd Poppy Seed Coffeecake recipe. 1. In a sauce pan, stir together lemon juice and sugar. Bring to boil. 2. 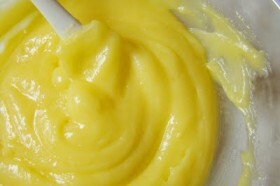 Temper egg mixture with 1 cup of the boiling lemon/sugar mixture. 3. Then add the egg mixture into the sauce pan with the remaining lemon/sugar mixture. Whip constantly until slightly thickened. Remove from heat. 4. Strain, add butter and zest. Mix until butter is melted. 5. Cover with plastic wrap and cool. This entry was posted in All things Culinary, General, Recipes and tagged best lemon pie filling recipe, creamy lemon curd recipe, creamy lemon spread recipe, easy lemon curd recipe, how to make creamy lemon spread, How to make lemon curd, how to make lemon pie filling, how to make lemon tart filling, lemon curd recipe, lemon pie filling recipe, lemon tart filling recipe by leslie. Bookmark the permalink.